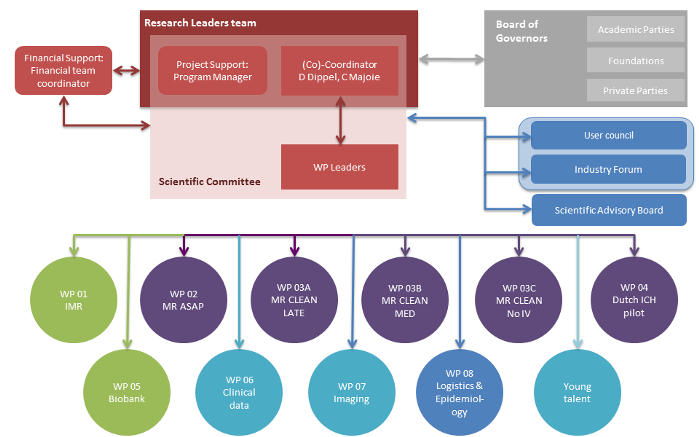 The consortium consists of 11 work-packages, each led by two WP leaders. Together with the research leaders and the program manager they form the scientific committee, which convenes on a monthly basis. A special financial support team consisting of two financial managers and two members for the scientific committee advises the research leaders team and the scientific committee with regard to obtaining funding and financial management. Every six months, the Scientific committee reports, through the RL team, to the funders. The board of governors, consisting of Academic partners, foundations and private partners, convenes at least annually. The user council consists of representatives of patient groups, clinical professionals, and a separate industry users forum. It will keep the consortium with one foot in reality and will be important in matters of implementation and communication of results. Finally, several renowned clinical and preclinical investigators have joined our scientific advisory board. • Rick van Nuland, Phd, Lygature; Utrecht. Disclosure: the CONTRAST consortium is supported by Netherlands Cardiovascular Research Initiative (CVON), an initiative of the Dutch Heart Foundation, and by the Brain Foundation Netherlands. AMC and Erasmus MC received additional unrestricted funding on behalf of CONTRAST, for the execution of MR CLEAN NO-IV from Stryker European Operations BV.